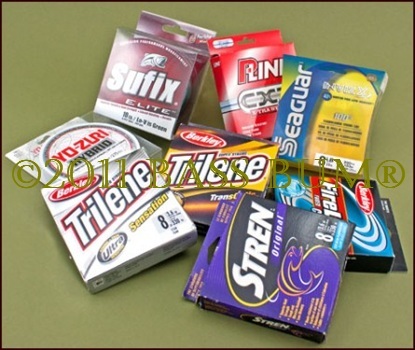 The Many Fishing Line Types Available Guarantee No Easy Answer! It's Not The Brand You Use - It's How and Where You Use The Brand! The best fishing line is the one offering the right combination of line strength, knot strength, abrasion resistance, tensile strength and color for a given bass fishing technique. It really depends on where and when you're fishing and the technique or bass lure you're using. Are you topwater fishing, fishing soft plastic lures like a plastic worm, cranking crankbait lures or using a live bait rig? A variety of different fishing line types can be used in each case, with different degrees of success should you choose one with features not suitable for conditions in which it's being used. Tensile Strength (straight line strength)is expressed in terms of "pound test". It relates to the amount of pressure that must be applied, by "pulling" or "stretching", to a piece of straight line before the molecular structure of the line is disrupted and the line breaks.This means that a line rated to be 12-pound test would break after being subjected to a steady pulling pressure equal to 12 pounds. Until recently fishing line breaking strength was seen as a direct function of fishing line diameter. However, improved monofilament lines have been developed in the last five to ten years that have thinner diameters but performance levels equal to earlier generation thicker lines. Shock Strength is the point at which the line will break if subjected to a quick, sudden jerk, as when you set the hook. The pound test found on fishing line packages is, first of all, almost always incorrect and usually understated. Secondly, it relates to breakage under a steady pulling force. Don't know about you but I've rarely had a bass break me off because it is exerting a steady pull. Usually it is accelerating, turning, diving or breaking the water's surface attempting to free itself when the break occurs. Knot Strength is another important consideration when debating features that contribute to what might be the best fishing line. Unfortunately, the tensile strength, what we anglers most often consider the "pound test" rating, has little to do with the strength of your knot. Abrasion Resistance is a particularly important and desirable feature of the sought after best fishing line. Again, the strength, pound test, has little to do with a line's abrasion resistance. Stretch relates to elasticity. The propensity for monofilament to stretch (as much as 25%) is seen by some as a positive (functions as a built in shock absorber when bass suddenly run) and others as a negative (reduces ability for a solid hook-set and reduces sensitivity). Compare this to braided lines that have virtually no stretch which translates into heightened sensitivity for the angler. You can feel a fish sneeze on your lure for gosh sakes! Additionally, no stretch can means instant, solid hook-sets. It can also mean ripping the hook right out of a bass' mouth if you're a Hulk Hogan type. Visibility is certainly a factor in our search for the best fishing line. However, it's probably one of the most subjective considerations. That visibility of line to bass in clear water or when fishing slow moving baits can work against the angler is pretty much a given. However, for those of us whose vision is not what it used to be or who are just "line watchers" colored lines can enhance our ability to detect strikes and ultimately result in more catches. Flexibility that is, a line's degree of limpness or stiffness, relates to manageability and line memory, both of which impact castability. Is There Really A Single Best Fishing Line? Probably not. None of the fishing line types, be it fluorocarbon, monofilament, braid or co-polymer, nor any single brand, possesses all the above features in ratios that maximize the potential benefit of each. They can't. Why you ask? Because in too many cases to have one trait means to have another one's potential benefit reduced. Say what? OK, let's look at a few that conflict. Fishing Line Strength for example, includes not just the fishing line test rating, the tensile strength. It also includes knot strength and abrasion resistance. No one of these is dependent on the other and it's very difficult to have the highest level of performance of each trait in a single line. Abrasion Resistance is claimed by every manufacturer, claims that are questionable unless they have been able to test their line in real life fishing situations. You know, dragging line across rocks, branches, shale and slate chips, fish teeth, gills, trolling motor propellers and even the effect clamping a split shot sinker on line has. Any tests performed on dry line are not relevant as well. The bass are in water and water affects the performance of line on several levels. If line is coated to make it more resistant to the sources of abrasion it will most likely also be stiffer and less castable. Manageability means enhanced castability and is usually found in thin monofilaments. However, the more castable a monofilament line, the thinner, more limp it probably is and the less abrasion resistant. Thinner lines suffer worse from nicks as there is just less material to absorb damage. Braided and fused lines don't suffer this fate and are very castable whether wet or dry. Visibility of line has no affect on its performance, though it may well impact that of the bass angler. Bass can see line, especially in clear water. are of negligible benefit in dark or low light conditions. The detection of "invisible lines" by bass compared to those that were not was little different. However, in bright light conditions and in very clear water there is a significant failure of detection by bass. Ask yourself. How often do you fish in bright light and extremely clear water conditions? Not often I bet. Though we all love those days. Also, many line manufacturers make a highly visible line, like Stren's clear blue fluorescent line, Trilene's Sensation blaze orange and P-Line's fluorescent green. Must be a lot of line watchers out there that catch bass. Seems every feature we bass anglers seek in our idea of what constitutes the best fishing line is in some way a trade-off with another. So we'll continue our quest to find the best fishing line by looking at some features and benefits of line types and manufacturer brands in more depth.